Darlene Johnson is from the Dunghutti tribe of the East coast of New South Wales and currently resides in Sydney. Her first short drama, Two-Bob Mermaid (1996), won the Australian Film Critics Circle Award for Best Australian Short Film. It was nominated at the Venice Film Festival for the Baby Lion Award. It won the Best Dramatic Short Film at the 41st Asia-Pacific Film Festival and is now used as a standard teaching resource in primary and secondary schools Australia-wide. In 2000 she wrote and directed Stolen Generations, which was nominated for an International EMMY Award as well as for Best Documentary at the 2000 AFI awards. It won the Grand Jury Journalist Award for Best Documentary at Film De Femmes International Women’s Film Festival in Paris and won the prestigious Golden Gate Award in the History category at the 2001 San Francisco International Film Festival and it has been sold to television in 8 overseas territories. In 2001 she wrote and directed a half – hour documentary Stranger in My Skin, as part of a television series Every Day Brave for Film Australia. It won the Tudawali Award for Best Documentary Series. She has also completed a documentary Following the Rabbit Proof Fence on the making of Phillip Noyce’s feature film Rabbit Proof Fence (2002). The documentary was also screened extensively on Qantas international airlines. She has also made three films in Arnhem Land, discussed in this interview. She is currently writing her first feature film, Obelia, to be produced by Phillip Noyce, while also completing a new documentary for ABC-TV, Wayne Blair: Shapeshifter. Therese Davis: Darlene, many thanks for presenting your work at U-matic to Youtube. We were so pleased that you accepted our invitation because you’ve been making award-winning films for fifteen years now and are very much involved in the development of Indigenous film and television in Australia. You were one of the young filmmakers included in the Australian Film Institute’s Indigenous Branch’s inaugural anthology From Sand to Celluloid (1996), and you produced one of the first guidelines on protocols for making films in Indigenous communities for SBS-TV. At the symposium we discussed a number of projects at the symposium that involved non-Indigenous filmmakers or anthropologists working with communities but, as you explained in your presentation, you’ve also made a lot of films with Indigenous communities from Stolen Generations (2000) – which was, I believe, the first documentary in which Indigenous people from communities across Australia told their story of being stolen from their families by government officials – to your most recent documentary River of No Return (2008), made in the remote community of Ramingining in Arnhem Land. In order to pick up on some of the issues and themes you raised in your presentation at the symposium, I’ll start by asking you your thoughts on the relationship between Indigenous communities and film since your involvement in this field in 1996. Darlene Johnson: The easiest way for me to answer is just to talk about my own personal experience. So, from the beginning, there is my first short film Two Bob Mermaid, which was commissioned as part of the From Sand to Celluloid anthology. That short, which was successful and won some awards, got me noticed and it created opportunities for me to then make longer format films. After making that first short, which was a story inspired by my mother’s experience of growing up under the assimilation policy and is about a young Koori girl who passes for white at a local swimming pool in country NSW, I sort of moved more into documentary. After that film, yeah, I guess I started mainly working in Aboriginal communities, making documentaries but also some dramas. I’ve actually spent more time working in remote Aboriginal communities in Arnhem Land than anywhere else. My first entrée into working within a remote community came about after a chance encounter with the legendary David Gulpilil, from Ramingining in Arnhem Land. I met David on the set of Rabbit Proof Fence (Phillip Noyce, 2002). I was doing the making of Rabbit Proof Fence – Following the Rabbit Proof Fence (2002) – around that time. David had previously seen my documentary Stolen Generations and told me how much he liked it, and he asked me if I’d be interested in doing a documentary about his life. I remember saying “Yes, yes, yes. Of course!”, wondering why no one had made a documentary about him before this. And then I jumped on this little plane, covered in red earth, on my way to the International EMMY awards in New York. While I was away I started to think about who David is and what he represents and how no other Aboriginal actor had had his longevity in cinema and TV. As we know, he’s an iconic figure that spans an amazing acting career over … what is it, three decades now? And I thought about how I could do justice to this person who has lived a really rich, complicated and, at times, conflicted lifestyle; someone who still lives the traditional way and moves in between that and more contemporary Australian life. And I also had to think about how I would go about approaching such a project that was primarily a profile or a social biography of someone who has been misrepresented, someone who I saw as being caught between two worlds. But what made for an interesting personal experience was the fact that he approached me: that was the initiation of a relationship that made the film possible. Based on that invitation by him I was able to go to his community and go on from there. So, for me, being invited to tell a story, make a film, is a crucial protocol. I would never in my own mind have thought that I, in my little abode at Bondi Beach, could just dream up the possibility of making a documentary about David Gulpilil. Not even! It wouldn’t have even occurred to me to do that, because for Aboriginal people that’s not how you go about things. So that entrée into working in remote communities came about because David invited me and, importantly, because he wanted someone – an Aboriginal person – to help him to tell his story, make a film, that would primarily tell the story from an Aboriginal point of view, like I’d done in Stolen Generations. And that was the genesis of our ongoing connection. TD: Was gender difference an issue? DJ: No, it wasn’t. It wasn’t an issue at all. The fact that I was a young girl who is, well you know, an urban, fair skinned Blackfella from Bondi Beach and he is a traditional Aboriginal Yolngu man from Ramingining – well, you might think that could have been a problem. But no, it was the fact that we were both Aboriginal that was the genesis of that connection, the invitation. I think he recognised that we are both passionate about portraying Aboriginality on screen and obviously portraying his voice; seeing who he is genuinely on the screen and not through some distorted white lens via some of the characters that he was so used to playing in movies. So I went on this journey with Gulpilil to his homelands, which resulted in our film Gulpilil: One Red Blood (2002). That was the beginning, and my film work in Ramingining has evolved from there. TD: Could you briefly describe the other projects? DJ: Crocodile Dreaming (2007): David and I decided to join forces again after One Red Blood, but this time we wanted to make a dramatic story that took into account David’s cultural perspective, spirituality and religion; a story that had never been portrayed on screen before. And it was important to him that we represented Yolngu spirituality in a modern, contemporary context. It was important that we made something for the kids, a document for posterity. But what was really exciting from my point of view is that I was given permission by him to create a fictional story inspired by the crocodile dreaming legend, and to bring my own artistic and directorial vision to the creative process. It’s important that people understand that it’s not the real crocodile dreaming legend. It’s not an adaptation. When I pitched the scenario to David he was all for it, and his only desire was to make it entertaining. And I thought, yeah, I can do that! River of No Return grew out of that project. Frances Djulibing, who was the lead female role in Rolf de Heer’s Ten Canoes (2006), has a role in Crocodile Dreaming, the mother. During the post-production process of Crocodile Dreaming, Frances told me about her childhood dream of wanting to be an actor just like Marilyn Monroe and how she’d seen The Seven Year Itch (Billy Wilder, 1955) for the first time in an outdoor cinema in Milingimbi. I thought to myself, you can’t get any further removed from Aboriginal traditional culture than Marilyn Monroe, and I wondered what it was about Marilyn that resonated with Frances. That was really the hook. I soon realised that it was Marilyn’s spirit, sense of humour, vivaciousness and her sexuality that Frances identified with. Basic human emotions and desires. The very things that all human beings want. I guess my thesis was really to explore how practical it was for Frances to continue to pursue the acting bug professionally as a result of the huge success of Ten Canoes. She wanted to see if it was feasible for her to do that, bearing in mind that she came from a very remote part of Australia and that she wanted to try her luck in the big smoke of Sydney or Brisbane. She wanted to see if she could survive there, so the film’s about that journey which I took with her. TD: One of the things that I particularly love about the films you’ve made in Ramingining is that we get a strong sense of your personal connection with people there. There’s that great reflexive scene in Crocodile Dreaming where you appear on screen playing a film director directing Gulpilil playing a celebrity film star. I think this device, but also other less explicit techniques – and, of course, the credits – allow viewers to understand that the people we’re seeing on the screen are actively involved in the project. The strong relationship between you behind the camera and Frances on screen in River of No Return is palpable. We can really sense that you guys are great friends. In my opinion, this aspect of your work distinguishes it from, say, a film like Ten Canoes, which was also made in Ramingining but with a non-Indigenous director. Rolf de Heer maintains a deliberate distance between himself and the film’s subject(s). Could you talk a little more about working in Ramingining, about working with David and his community on these projects, as an Aboriginal filmmaker who is passionately interested in questions about how to represent Aboriginality? What was your approach? DJ: Obviously the main thing about working in a remote community that is really traditional is that there are a whole lot of protocols and social and cultural codes about how one lives and how the world works. To put it really simply, it’s working from a cultural perspective, and it’s a way of living that is sometimes in antithesis to western ways of doing things. So, you know… the truth be known, when I made One Red Blood, the schedule went out the window on the very first day, because there’s a whole different way that people live and do things and see things there, how they operate and how their society works. And for me it wasn’t simply about being a filmmaker going into an Aboriginal community – even though I was that – but it was absolutely about becoming part of the fabric of everyday cultural life and part of the familial life of the people that I was working with, mainly David and his family. I actually became part of the tribe, part of the mob. And I was given a skin name, etc. So people just didn’t see me as some outsider, they actually saw me as having a real relationship with them, you know. That relationship is real. And that’s what I love about the process – that it’s absolutely real, that it’s not that I’ve got any special status because of what I’m doing but that I’m part of the mob. There were interesting encounters with mob at times because I’m a woman and it was kind of different for them to see a Blackfella – a female Blackfella – making films. But that was just a new experience for them, and I think it was good for them to see me, a Black woman outside of a traditional female role. In fact my nickname was ‘boss woman’, because they could see that I was directing and, you know, bossing my white male crew around [she laughs], you know, just really organising things and getting things done, taking that role. But basically my relationship with David and the mob was built over many, many years. Eight, nine, ten years now, which comes down to the building of incredible trust between people: between me and his family and between me and the wider community up there. And also, I think it’s about cultural exchange, and understanding, and respect, and it’s about having patience, and it’s about not making assumptions about things or people. You can’t be a dictator and a control freak. You can’t want to do things this way or that because, well, you know, that’s the Western model for making films – the idea that the director has got to be the leader and you’re supposedly controlling everything on set; the idea that the film is about what you ultimately want. It doesn’t work that way. You have to remain open to the culture, the spirituality of the people and the place, and allow the story and characters to evolve and manifest. TD: So you’ve developed a different model? DJ: Actually, when you’re working in the community, well for me, a lot of how I find the story or understand the structure or the purpose or its meaning – that cultural specific that I hope will resonate in the film – is to wait for it to come from the people that have a connection to that place. So, for me, I try to work culturally as much as possible. I try to allow for the cultural perspective of the people and that world to drive what I’m doing, to drive the process. It’s about being a part of a larger community. That was what was so unique about it. I think that that community perspective should absolutely dictate a pathway for the film and guide me. And there’s nothing better than to have that kind of understanding. For me, that is, just like, well … that’s gold – to be able to see how the people and the culture are bringing so much to the process. It’s complicated, it takes time, it’s very organic and intuitive process; but, as a result of doing one project that way, I’ve been able to go back and continue and to make two more films with the same community effectively, but on different country. So now I’ve made three films in Arnhem Land over the course of nine years or so. Sorry, that’s a long way of answering your question. TD: No, no. It’s really interesting, Darlene. I think that the model that you describe shapes the films you make. As I said, I think we can sense the relationship that you’ve developed with the community in your films. They’re all very unique in terms of the modes of storytelling you adopt, very different kinds of films, but they are, I think, also very clearly exploring Aboriginal ways of telling story in film. And that’s obviously one of the real strengths – and the beauty – of your films. I’m wondering, when you talked about an invitation being a kind of protocol – your point earlier that, as an Aboriginal person, you wouldn’t have thought about going to a community to make a film without an invitation – is that invitation also a form cultural obligation? Are you obliged to stay connected to the community? Is that part of the deal? DJ: I would say responsibility rather than obligation. There’s a sense of responsibility that comes with the invitation. And to me that’s significant. I take that very seriously. For David [Gulpilil] to invite me to do that project – well, I then had to live up to my bargain with him and be absolutely responsible in my role as a filmmaker and be responsible as an Aboriginal person to the wider Aboriginal community. And to me, that’s exactly what makes me want to do a good job. But that responsibility can also be hard and difficult at times, and it puts me in very compromising positions, because it can be about ‘the people versus the project’ and the issues that might conflict with the project or around it. Or it can just be the mere fact that mob don’t really know how the filmmaking process works. So I try to explain that as much as possible, so people can better understand where I’m coming from with all that. I spend the time and show mob how I do things and involve them in that process. That is part of what I do as Aboriginal filmmaker, what I want to do. It’s all those things: like the production processes, and the people, and the stories, the discussions about whose story it is, and whose voice it is. For me, all that is where the film is at; that’s where the action is, and I like to be in that position because I want to be the bearer of these stories. To look after cultural knowledge is a huge privilege, actually. I want to fight for that. I want to do my very best job. And I want to be involved in all those issues so we, as Aboriginal people, can nut them out together and detangle what they are and how they affect everyone, so we can work out the best way forward for us. And, hopefully, that will make for a better film. So, yeah, I take on that responsibility with pride and respect, because I hope that it will make me do the very best job that I can and because I don’t see being there as just filmmaking, but speaking up with conviction and being strong. I see it as taking a stance, a point of view, having an opinion. TD: How do you plan for that kind of approach? DJ: Each project is really, really important and it should be to some extent – or to a big extent. It’s a huge privilege to be doing it. You’re involved with people’s real lives. It’s serious stuff. And it’s difficult because you don’t always know the issues in advance, so you’re always treading a fine line while you discover the issues. I’d say it’s an evolving process of learning and understanding all of the things that matter to all of the people that are involved in the project – everyone who is affected by the filmmaking process as well as those who are actually in the film itself. Everyone matters. So, it’s a very delicate process. But it’s amazing as well! I love it! TD: Would you agree that this kind of cultural responsibility, and the model of consultation and collaboration based on a connection to community that you’ve been describing, puts you in a different position to a non-Indigenous filmmaker working with a community, even if he or she is invited? I mean that person is not responsible to the wider Indigenous community in the way that you are suggesting. It’s not their culture. I’m wondering to what extent people in the film and television industry in Australia outside of the Indigenous Department [of Screen Australia] can appreciate and understand this position and the models of filmmaking it requires? How do you negotiate these things when you’re working with non-Indigenous producers or commissioning editors. DJ: Well, I’m a freelance filmmaker, so I think any model is really up to the individual filmmaker. It’s partly about developing one’s own methodology. That’s how I’ve understood it, and that’s how I’ve arrived at what I do. Nobody has come to me and said, “This is how you do things”. But I also think the challenge for us as Indigenous filmmakers is how we can develop and make films and create our own forms of storytelling that are appropriate to the people, and the places that the people are speaking from, the places where we’re making these films and also have universal appeal. Like I said, I think it’s actually our responsibility to do that. I don’t know that the broader industry necessarily understands the real issues facing Indigenous filmmakers. I think that unless you’ve actually worked in Aboriginal communities and you’ve stepped inside a community, that you know Aboriginal people, that you’ve lived with them and you know what the issues are, well, then you can’t really understand. It’s a knowledge that comes out of a practice, an experience, a way of living. Not many non-Indigenous producers have that. I’ve got to admit that, so far, all of the producers I’ve worked with have been non-Indigenous, and one of the key things that I want to do now is move more into producing. I think as a writer/director it’s kind of a natural progression to move into the producing side of things – so you’re not just being across the creative and cultural side of things, but the actual organisation of the film, the running of a shoot, the nuts and bolts. I want to develop more of an integrated approach, so that the cultural integrity of the storytelling can be maintained throughout each stage of the production process. I’d like there to be greater understanding of how we [Indigenous filmmakers] make films. We are telling our own stories and we are helping to tell a lot of other Aboriginal people’s stories, so that’s sacred and that must be properly respected and understood. We have very unique connections and ways of doing things based on our relationships with people in communities that comes from a place of incredible trust and shared experience, that has been built up over long periods of time. So when I’m working with producers – who, as I’ve said, have always been non-Indigenous – I think I’m actually presenting them with a model of how I work, how I do things as an Aboriginal person, and they are just not cultural things, they are also practical things as well. I’m showing them through my films that this is a particular approach that I have and that it’s culturally appropriate. I think most producers find it very hard to understand the issues about relationships and trust and culture and respect that pertain to Aboriginal people in various communities. They think that producing is about being in control and running the show, being in control of the schedule and the budget, etc. But all I’m saying is that in Indigenous filmmaking it’s not just about controlling a shoot, etc. It’s not about power. It’s about cultural understanding, exchange and respect. You see in the Western model of filmmaking people are often fighting for their bit of power in the game, in the filmmaking process. I understand that. It’s a hierarchy of power. But in my films, for example, it’s not relevant for the producer to go out on location to a remote community or to decide whether I use this camera person or that sound crew. That has to be the Indigenous director’s job. It’s not up to them to make those kind of decisions, and I’m talking more in documentary, because it’s not their experience. They’re not the one on the ground doing it so, as far as the community is concerned, they don’t have any right to make decisions about what goes on within that community. The film is part of the fabric of community life. It has to be. I guess I’m talking about a model where the director is effectively the producer as well, because it’s their connection to the people, and the trust that they have within the community, and the invitation they have from people, and the access they have from the people to be there on the land in the first instance – well, you see all that makes the film possible. So you can see that the Aboriginal person who is directing is also effectively producing the project. But a lot of producers don’t normally want to work like that. They would normally see it as a separate job, and I’m saying they’ve got to understand that when it comes to Aboriginal culture their way is not relevant, not culturally appropriate. I’m saying they’ve just got to trust that the Aboriginal filmmaker knows what he or she is doing and just let them get on with it, support the Aboriginal filmmaker’s vision, and support the cultural approaches that they need to take in order to make the films that they and the communities want to make. I think we’re yet to get to that point. And I think partly the problem is because we don’t have enough Indigenous producers. If we had more Indigenous producers who actually understand what the issues are, then hopefully the industry would move towards understanding that a new approach, a new model of filmmaking is required when you’re working with Aboriginal communities and telling Aboriginal stories. * Darlene Johnson wrote and directed the film; it was produced by Tom Zubryki. 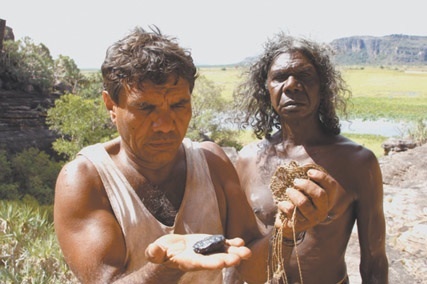 The copyright is jointly held by Johnson and David Gulpilil.